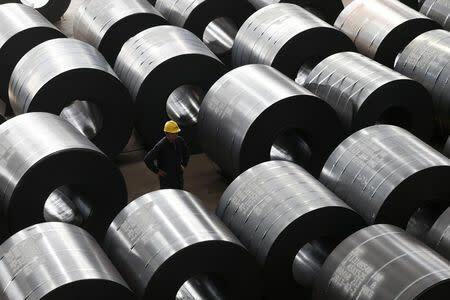 SHANGHAI (Reuters) - China's steel industry needs to speed up its restructuring by slashing excess capacity, improving efficiency and switching to higher-quality products, with output now approaching its peak, a senior industry official said. "China's steel sector has already entered a period of peaking and flattening out," Zhang Guangning, chairman of the China Iron & Steel Association (CISA), told its annual meeting on Monday. Speeches were published on the association's website on Wednesday. CISA officials have been cautious about putting a date on when production would peak. They have previously said it could happen by the end of the decade. A peak in output in the world's biggest steelmaking country could rein in iron ore imports, which surged 14 percent to a record 932.5 million tonnes last year, and could also have implications for coal demand, which some expect to plateau before the end of the decade. According to the published speeches, the CISA estimated that Chinese steel output reached about 815 million tonnes in 2014, lower than its revised figure of 822 million for 2013. Zhang, who is also chairman of the Anshan Iron and Steel Group, one of China's oldest and biggest state mills, said the country's slowing rate of growth had piled pressure on the sector, and it now needed to take rapid action to improve its competitiveness and focus on quality rather than quantity. China's total capacity stands at around 1.2 billion tonnes but expansion has slowed considerably, with some analysts estimating that only about 10 million tonnes from new plants would come into operation this year. Li Xinchuang, CISA's vice secretary general, forecast in December that Chinese steel production would rise to 834 million tonnes in 2015. Chinese steel consumption was expected to increase 1.4 percent to 720 million tonnes, with growth slowing from 2.5 percent in 2014. Global miner BHP Billiton has stopped approving new investment in major iron ore production capacity as it expects growth in Chinese steel consumption to slow this year.